With massive scarring down the left side of her face she demands your full attention on arrival and responds by putting on a thrilling display. 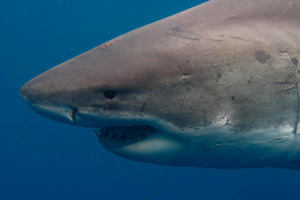 We really got to know this shark during the 2014 Guadalupe season where she stole the show on many occasions. During a two week film shoot deep into November, Emma also obliged to perform for the cameras on many dives. 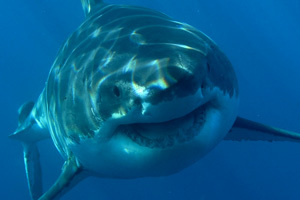 Most notably lunging at Discovery Channels’ Phantom camera and having her bite recorded at over 1000 fames per second. An incredible shot featured in shark weeks’ 2015 productions. Originally spotted in 2012, Emma was named by renowned cameraman Andy Casagrande after his wife. 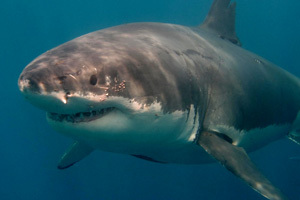 She has now been added to the ever-growing ID catalogue that has documented over 200 sharks at Guadalupe since 2001. With many years to go we look forward to plenty more interactions with this shark and getting to know many more yet to be identified individuals. Share the Emma the shark love on Facebook! Want to meet Emma? Book with Shark Diving Xperts today!